Help students answer questions such as “What is a thermometer?” and “How does it work?” by completing a series of hands-on experiments. 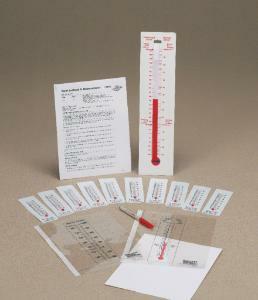 Ten alcohol plastic-back thermometers also offer practice reading Celsius and Fahrenheit temperature measurements. Includes instructions with suggested lesson plans and pre- and post-tests.